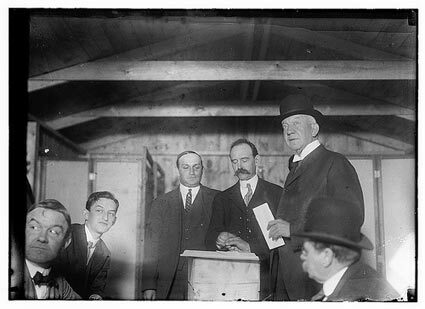 November 6, 1914– Former City Council President and acting Mayor Walter Larchmont warily casts his ballot in the emergency election called after Mayor Jonathan T. Sanders succumbed to influenza in October. Former Deputy Mayor Sanders himself had taken over after Mayor Jonah Woolsey fell to the disease in September. Larchmont needen’t have worried- he was easily elected for this and two more terms. He died in his sleep of natural causes in 1929, aged 77.